Disgruntled Apna Dal MP and Union minister of state Anupriya Patel caused alarm within the BJP last week in Parliament by cosying up to the Congress. Although she has officially said there are no problems between her party and the BJP, her behaviour in the House and outside when Parliament reopened after the Christmas break suggested otherwise. Amid complaints that the BJP is ignoring its allies, Anupriya Patel walked up to the Congress benches one morning when the Lok Sabha was adjourned briefly after disruptions. She hasn’t done this before so her sudden friendliness towards the BJP’s arch rival raised eyebrows all around. She sat down with them for several minutes and seemed to be engrossed in animated conversation. BJP MPs who were leaving the House for the break kept turning around to look at her. They were burning with curiosity and seemed to be trying to read her lips to guess what she was saying. Later, after she left the House, she went up to Congress senior Digvijaya Singh and sat with him for a long time. Interestingly, she kept looking around to see if any BJP colleagues were around and whether they were watching her. Anupriya Patel is obviously playing games with the BJP and keeping them on tenterhooks about her intentions. She is aware that Ram Vilas Paswan managed to squeeze an extra Rajya Sabha seat out of the BJP in Bihar after his son openly flirted with RJD’s Tejaswai Yadav. 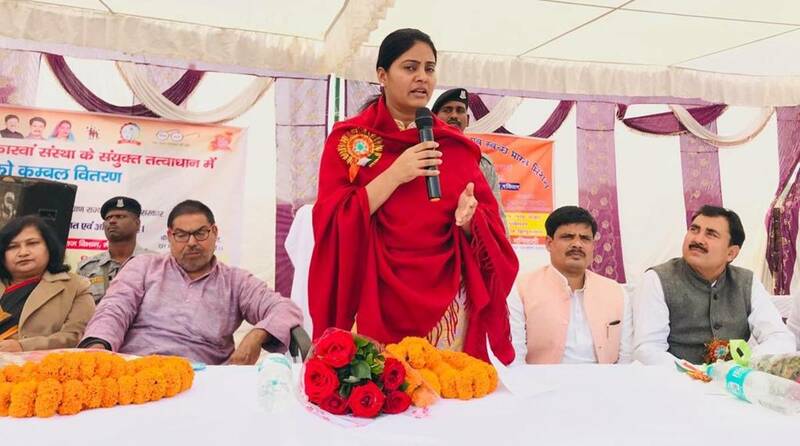 With the BJP on the backfoot after its recent losses in the Hindi heartland, Apna Dal seems to have taken a leaf out of Paswan’s book to get a better bargain for itself in UP. Akali-Congress bonhomie In this season of political bargaining in the run up to the 2019 polls, no party is untouchable as all barriers are down. On the same day that Apna Dal’s Anupriya Patel created a tizzy with overtures to the Congress, there was a display of unusual bonhomie between the Akali Dal and the Congress as well. It happened when Congress Lok Sabha MP Ranjeet Ranjan demanded that the House observe two minutes of silence to mark the martyrdom of Guru Gobind Singh’s two sons who were bricked alive by Wazir Khan in 1705 on the orders of Mughal emperor Aurangzeb. Her demand was picked up by Chandumajra of the Akali Dal. Lok Sabha Speaker Sumitra Mahajan paid no heed to them. This prompted Congress MPs, led by Sunil Jakkhar, to walk across to the other side to where Chandumajra was seated and make it a joint Congress-Akali appeal. The common bond was Punjab’s history. It didn’t matter that the two parties are political rivals. It was an embarrassing moment for the BJP as its ally and rival joined hands. For once, the BJP’s political reflexes were slow. Its MPs failed to pick up the issue and add their voice to the demand, leaving the floor open to the Akali Dal and Congress to make common cause. Another cricketer seems to have developed political ambitions. The buzz in BJP circles is that Gautam Gambhir is in the running for a party ticket from Delhi to contest the 2019 Lok Sabha elections. BJP circles say Arun Jaitley, who has a soft corner for cricketers because of his long association with DDCA and BCCI, has mooted the suggestion to field Gambhir from one of the seven constituencies in the Capital. Gambhir is a Delhi boy and now that he is no longer an active player, he has turned his attention to cricket administration and politics. He was recently appointed to the DDCA board as a government nominee and within cricketing circles, it is being said that he has set his sights on becoming DDCA chief one day. But the first stop is politics and Gambhir has been candid enough to admit to friends and well wishers that he wouldn’t mind contesting the upcoming Lok Sabha election if he gets a ticket. A role for Sharmistha Mukherjee? Amid talk of a Congress-AAP alliance in Delhi for the Lok Sabha polls, there is also speculation that there may be a change of guard in the Congress party’s state unit if the tie-up actually goes through. The name doing the rounds as a possible new party president for Delhi is that of Sharmistha Mukherjee, former President Pranab Mukherjee’s daughter. It is well known that the president Delhi chief Ajay Maken is totally against an AAP-Congress alliance and has been trying to put spokes in the behind-the-scenes negotiations. Many in the Congress feel that Sharmistha is more diplomatic, would handle AAP better and also be more acceptable to Arvind Kejriwal. She has no obvious antipathy to AAP unlike Maken. What has added fuel to the speculation about Sharmistha as Congress Delhi chief is her withdrawal from television debates as party spokesperson. Sharmistha had become quite a regular on TV debates and acquitted herself well with her stout defence of her party. Of late, however, she is rarely to be seen in panel discussions. Instead, she has taken to giving sound-bytes rather than indulging in the slanging matches that pass off as debates. In the hierarchy of politics, senior leaders do not participate in TV debates. They only do one-on-one interviews or give sound-bytes to the cameras. The buzz in Congress circles is that Sharmishtha is moving up the party ladder and is being groomed for a bigger role.